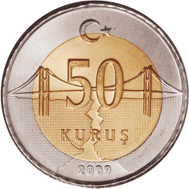 Kuruş (derived from the German Groschen; Ottoman Turkish: غروش gurûş) is a smaller unit of Turkish currency. Since 2005, one new Turkish lira is equal to 100 kuruş. It was first introduced in 1688. Kuruş Facts for Kids. Kiddle Encyclopedia.